Bounce.com reports Japanese actress Tomosaka Rie will release a new album, Toridori, on June 24. Also arriving the same day is a reissue of her best album, rie tomosaka best + 3. In addition to contributions by Shiina Ringo and members of Tokyo Jihen, the eight-track Toridori includes collaborations by Kimura Kaela and Clammbon’s Harada Ikuko and Mito. The best album is the same as her 1999 release, with the addition of the "Shoujo Robot" single written by Shiina and released in 2000. A while back I mentioned Hatakeyama Miyuki is releasing a solo career retrospective. Well, the track list of the album, titled CHRONICLE 2001-2009, is now available. Although released on Hatakeyama’s current label, Rhythm Zone, the album contains tracks from her EMI Japan years, as well as various theme songs she’s recorded for a number of films. The collection has 18 tracks total. UA is set to release a new album, titled ATTA, on July 22. This time around, she works with the likes of YOSHIMO from the Boredoms, Hosono Haruomi and Asamoto Hirofumi. Also arriving July 22 is a new single by Onitsuka Chihiro, titled "Kaerimichi wo Nakushite". Bounce describes it as a "straight, majestic ballad". Her latest single, "X/Last Melody", is released today. ART-SCHOOL is currently in the studio putting the final touches on its next album to be released on Aug. 5. 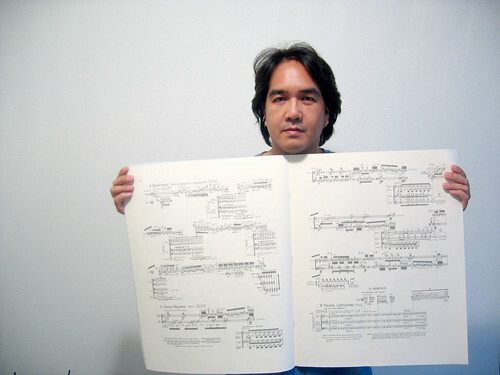 The album features new member Suzuki Hiroyuki, who replaces drummer Sakurai Yuuichi. Today (May 20) is a pretty big release day. In addition to the aforementioned Onitsuka, new releases by Sasagawa Miwa, detroit7, Fuji Fabric and FLiP hit the stores. Alas, I pre-ordered none of these, thinking I may pick them up later in the year, when I head to Japan for vacation. I really, really want to hear the new Sasagawa and FLiP albums. FLiP’s Haha kara Umareta Hinekure no Uta has become one of my favorite late discoveries, and I’m glad I caught the band at the Japan Preview party at SXSW this past March. I hope Fuji Fabric’s previous album, TEENAGER, is still around — I never picked it up, even though I like it alot. And just how am I going to fit that on the book shelf? Still got nothing. Still listening. Still letting the backlog grow. So how about some pictures? 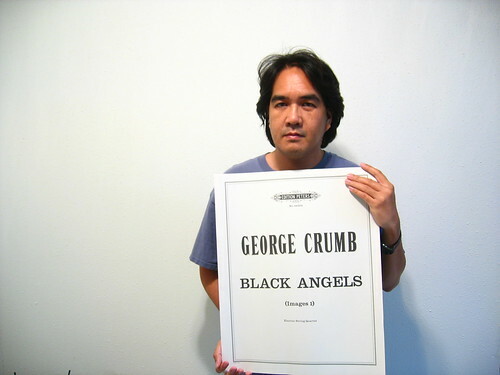 One of the birthday gifts I gave to myself was a score to George Crumb’s Black Angels. I’ve only ever seen an excerpt of this score shrunk down to fit the size of a college textbook (the Norton Anthology of Music, to be exact.) I’ve never seen the actual score. I didn’t think it was going to be that big. A while back, I mentioned a site called Sheet Music Plus. At the time, the site didn’t have a wish list functionality similar to Amazon. Well, it does now, and I even created a list for myself. The sale was just the thing to spur me to grab a whole bunch of scores I’ve been meaning to get. I’m using these scores as research for the next time I try my hand at writing a string quartet. I would like the one string quartet I wrote back in 1990 — before I took even a single music theory class — not to stand on its own. But I have to do my homework first. UPDATE, 05/20/2009, 09:51: Sheet Music Plus recently redesigned its website, and on the whole I really like it. But in doing so, they broke the list functionality, which won’t be available again till June 2009.